For the type of fungus, see Stalagmites (fungus). 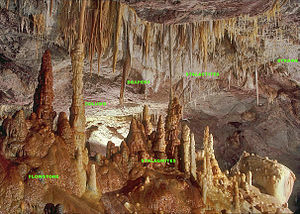 Image showing the six most common speleothems with labels. Enlarge to view labels. A stalagmite (UK: /ˈstæləɡmaɪt/ or US: /stəˈlæɡmaɪt/; from the Greek σταλαγμίτης - stalagmitês, from σταλαγμίας - stalagmias, "dropping, trickling") is a type of rock formation that rises from the floor of a cave due to the accumulation of material deposited on the floor from ceiling drippings. Stalagmites may be composed of lava, minerals, mud, peat, pitch, sand, sinter and amberat (crystallized urine of pack rats). 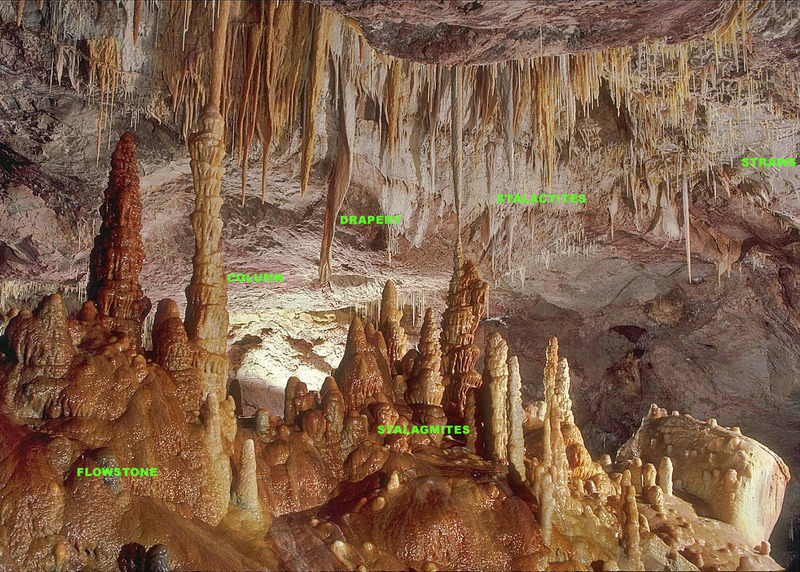 The corresponding formation hanging down from the ceiling of a cave is a stalactite. Mnemonics have been developed for which word refers to which type of formation; one is that stalactite has a C for "ceiling", and stalagmite has a G for "ground". The most common stalagmites are speleothems, which usually form in limestone caves. Stalagmite formation occurs only under certain pH conditions within the cavern. They form through deposition of calcium carbonate and other minerals, which is precipitated from mineralized water solutions. Limestone is the chief form of calcium carbonate rock, which is dissolved by water that contains carbon dioxide, forming a calcium bicarbonate solution in caverns. The partial pressure of carbon dioxide in the water must be greater than the partial pressure of carbon dioxide in the cave chamber for conventional stalagmite growth. If stalactites – the ceiling formations – grow long enough to connect with stalagmites on the floor, they form a column. Stalagmites should normally not be touched, since the rock buildup is formed by minerals precipitating out of the water solution onto the existing surface; skin oils can alter the surface tension where the mineral water clings or flows, thus affecting the growth of the formation. Oils and dirt from human contact can also stain the formation and change its color permanently. Another type of stalagmite is formed in lava tubes while lava is still active inside. The mechanism of formation is similar to that of limestone stalagmites. Essentially, it is still the deposition of material on the floors of caves; however with lava stalagmites, formation happens very quickly in only a matter of hours, days, or weeks, whereas limestone stalagmites may take up to thousands of years. A key difference with lava stalagmites is that once the lava has ceased flowing, so too will the stalagmites cease to grow. This means if the stalagmite were to be broken it would never grow back. Stalagmites in lava tubes are rarer than their stalactite counterparts because during formation the dripping material falls onto still-moving lava floors that absorb or carry the material away. The generic term "lavacicle" has been applied to lava stalactites and stalagmites indiscriminately, and evolved from the word "icicle". A common stalagmite found seasonally or year round in many caves is the ice stalagmite, commonly referred to as icicles, especially in above-ground contexts. Water seepage from the surface will penetrate into a cave and if temperatures are below freezing temperature, the water will collect on the floor into stalagmites. Deposition may also occur directly from the freezing of water vapor. Similar to lava stalagmites, ice stalagmites form very quickly within hours or days. Unlike lava stalagmites however, they may grow back as long as water and temperatures are suitable. Ice stalagmites are more common than their stalactite counterparts because warmer air rises to the ceilings of caves and may raise temperatures to above freezing. Ice stalactites may also form corresponding stalagmites below them, and given time, may grow together to form an ice column. Stalactites and stalagmites can also form on concrete ceilings and floors, although they form much more rapidly there than in the natural cave environment. The secondary deposits derived from concrete are the result of concrete degradation, where calcium ions are leached out of the concrete in solution and redeposited on the underside of a concrete structure to form stalactites and stalagmites. Calcium carbonate deposition as a stalagmite occurs when the solution carries the calcium laden leachate solution to the ground under the concrete structure. Carbon dioxide is absorbed into the alkaline leachate solution, which facilitates the chemical reactions to deposit calcium carbonate as a stalagmite. These stalagmites rarely grow taller than a few centimetres. Secondary deposits, which create stalagmites, stalactites, flowstone etc., outside the natural cave environment, are referred to as “calthemites”. These concrete derived secondary deposits can’t be referred to as “speleothems” due to the definition of the word. The largest known stalagmite in the world exceeds 70 metres (230 ft) in height and is in Sơn Đoòng Cave, Vietnam. In the Zagros Mountains of south Iran, approximately 6 km (3.7 miles) from the ancient city of Bishapur, in the Shapur cave on the fourth of five terraces stands the 3rd-century colossal statue of Shapur I, second ruler of the Sassanid Empire. The statue, carved from one stalagmite, is nearly 7 m (23 ft) high. ^ σταλαγμίας, Henry George Liddell, Robert Scott, A Greek-English Lexicon, on Perseus. ^ a b c Larson, Charles (1993). An Illustrated Glossary of Lava Tube Features, Bulletin 87, Western Speleological Survey. p. 56. ^ Hicks, Forrest L. (1950). "Formation and mineralogy of stalactites and stalagmites" (PDF). 12: 63–72. Retrieved 2013-07-08. ^ "How Caves Form". Nova. PBS. Retrieved 2013-07-01. ^ C. Michael Hogan. 2010. “Calcium”. eds. A. Jorgensen, C. Cleveland. Encyclopedia of Earth. National Council for Science and the Environment. ^ John), Fairchild, Ian J. (Ian (2012). Speleothem science : from process to past environments. Baker, Andy, 1968-. Oxford, U.K.: Wiley. ISBN 9781444361094. OCLC 782918758. ^ Keiffer, Susan (2010). "Ice stalactite dynamics". Retrieved 2013-07-08. ^ Lacelle, Denis (2009). "Formation of seasonal ice bodies and associated cryogenic carbonates in Caverne de l'Ours, Québec, Canada: Kinetic isotope effects and pseudo-biogenic crystal structures" (PDF). Journal of Cave and Karst Studies. pp. 48–62. Retrieved 2013-07-08. ^ a b c Smith, G K. (2016). "Calcite straw stalactites growing from concrete structures". Cave and Karst Science 43(1), pp4-10. ^ Macleod, G, Hall, A J and Fallick, A E, 1990. An applied mineralogical investigation of concrete degradation in a major concrete road bridge. Mineralogical Magazine, Vol.54, 637–644. ^ Sundqvist, H. S., Baker, A. and Holmgren, K. (2005). "Luminescence in fast growing stalagmites from Uppsala, Sweden". Geografiska Annaler, 87 A (4): 539-548. ^ "Son Doong Cave (Hang Sơn Đoòng)". Wondermondo. Wikimedia Commons has media related to Stalagmites.